Trapped crabs Nine dead blue crabs occupy a derelict crab pot retrieved from the waters of Chesapeake Bay. © K. Havens/VIMS. Watermen at work Local watermen retrieve a derelict crab pot from Chesapeake Bay. © K. Havens/VIMS. A new study estimates that derelict or “ghost” crab pots catch more than 6 million blue crabs in Chesapeake Bay each year, with more than half these crabs—3.3 million—succumbing to their captivity. The good news is that efforts to remove derelict pots have paid off in a big way, increasing baywide harvests by 38 million pounds over 6 years. That’s an extra $33.5 million in the pockets of Bay crabbers. Results of the study were issued in a 93-page report published last week by the National Oceanic and Atmospheric Administration (NOAA). Contributing to the study and report were researchers at William & Mary’s Virginia Institute of Marine Science, CSS-Dynamac, Versar, and Global Science & Technology. Funding for the study and report came from NOAA’s Marine Debris Program. The NOAA report builds on earlier independent efforts in Maryland and Virginia to locate and when possible remove derelict fishing gear from Bay waters. 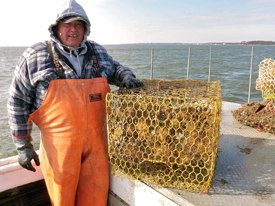 In the Virginia project, VIMS professor Kirk Havens, Bilkovic, and colleagues Kory Angstadt and David Stanhope partnered with local watermen between 2008 and 2012 to remove more than 32,000 derelict crab pots from lower Chesapeake Bay. Havens, Angstadt, and Stanhope are additional co-authors on the recent NOAA report. The multi-institutional team conducted the recent baywide study by combining data from these earlier field efforts with findings from laboratory experiments and statistics from the blue crab fishery, recreational and commercial vessel traffic, crabber surveys, and other sources. They then analyzed and fed these data into geospatial and economic models. The team then used a separate computer model to evaluate how removing derelict pots would affect the blue crab fishery. Says Scheld, “We used a harvest model to compare actual commercial landings during years when derelict pots were being removed from the Bay against the harvests one would have expected if no derelict pots had been removed.” Model results showed that pot removals increased baywide harvests between 2008-2014 by more than 38 million pounds. That’s 23.8% of the overall harvest during the 6-year period, with a value of $33.5 million. Of the ~ 600,000 pots that crabbers deploy in the Bay each year, 12-20% are lost or abandoned. That’s 72,000-120,000 new derelict pots annually. There are currently about 145,000 derelict pots baywide; 58,000 in Maryland and 87,000 in Virginia. Derelict pots catch more than 6 million crabs each year, and kill more than half of these (3.3 million). That’s 4.5% of the 73 million crabs harvested in 2014. Pot removals increased baywide harvests between 2008-2014 by more than 38 million pounds. That’s 23.8% of the overall harvest during the 6-year period, with a value of $33.5 million. Targeted pot removals in heavily fished areas would be a highly cost-effective way to increase catch efficiency and reduce bycatch mortality. Removing even 10% of derelict pots from the 5 most heavily fished sites in Virginia and Maryland would increase the baywide blue crab harvest by 22 million pounds or approximately 14%. Minimizing overlap between crabbing and boat traffic, and educating vessel operators to avoid pots, would greatly reduce pot loss. Use of biodegradable escape panels would likely reduce mortality in derelict pots from more than 3.3 million crabs per year (4.5% of the harvest) to less than 440,000 crabs per year (0.6%).